It would appear this family took it to the next level. I snapped this pic on a flight (from hell) home from Florida. Have to admit, this one was pretty creative. Ever heard of a chip butty? 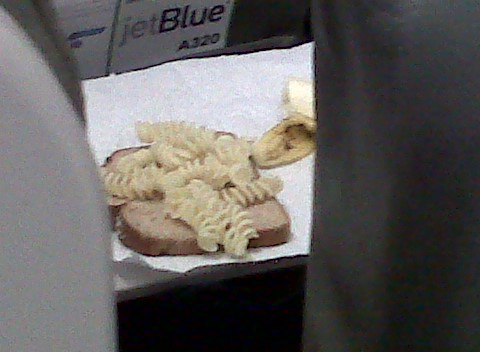 That’s a sandwich with French fries. Or a deep-fried Mars Bar? It’s a delicacy in Scotland apparently. Salt and vinegar optional. Orla, hose are some funky delicacies! Ha. Ew.. Hey might be a natural sleeping agent, all those carbs, and this parent is ON to it?? 🙂 Showed this to my little guy. His response: YUM! Guess I’ll be packing up the mac and bread next trip!! The kid was happy as could be when he was eating, but later on when the flight was so delayed he was in a carb-frenzied misery. Ok, maybe it wasn’t the carbs, could have been the circling. Hey, what kid wouldn’t love this? There was even a side of banana.